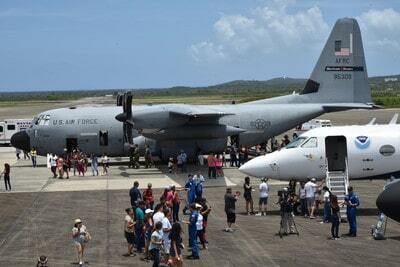 With the 2019 hurricane season fast approaching, NOAA and the U.S. Air Force Reserve will host a series of events, including tours aboard the hurricane hunter aircraft, to help communities in Mexico and the Caribbean prepare for the season and the coming storms. National Hurricane Center Director Ken Graham and several federal hurricane specialists will visit with residents of vulnerable communities and discuss hurricane preparedness, resilience and how they can become “weather-ready.” Tours of the Air Force Reserve Command’s WC-130J “Hurricane Hunter” will offer an opportunity to learn how scientists collect hurricane information. The NOAA WP-3D aircraft, used for both hurricane forecasting and research, will be on display as well. During hurricanes, military aircrews fly state-of-the-art WC-130J aircraft directly into the core of tropical cyclones to gather data that are critical for forecasting a hurricane’s intensity and landfall. The data is sent in real time via satellite from the aircraft directly to NOAA’s National Hurricane Center for analysis and use by hurricane forecasters. Also participating in the tour will be senior hurricane specialists Lixion Avila and Daniel Brown from the National Hurricane Center; U.S. Air Force Reserve Citizen Airmen from the 403rd Wing’s 53rd Weather Reconnaissance Squadron at Keesler Air Force Base, Mississippi; and the flight crew of NOAA’s WP-3D stationed at Lakeland Linder Airport, Lakeland, Florida. The eastern North Pacific hurricane season officially begins May 15 while the central North Pacific and Atlantic basin hurricane seasons begin June 1.